We have learned that Robert Mathis will be required to serve a four game suspension under the League’s policy on prohibited substances. We recognize the extreme seriousness of this matter and will honor the confidentiality requirements of the League’s program. We nevertheless wish to assure Robert and our fans that he remains an honored and cherished member of the Colts family and that we support him as he deals with this difficult challenge. Intro: Indianapolis wiped out the biggest deficit in franchise history and the second-largest in NFL playoff history by earning a 45-44 victory in the Wild Card round after trailing Kansas City, 38-10, in the third quarter. It was the fourth comeback win by the Colts in 2013, and it sends them deeper into the playoffs than they have been since 2009. INDIANAPOLIS – Saturday’s improbable and pulsating 45-44 victory over Kansas City in the Wild Card playoffs was achieved by Indianapolis overcoming the largest deficit in franchise history and the second-largest ever in league post-season play. The Colts did almost enough to lose before finishing a nose ahead in what Chuck Pagano called an “epic” victory. Indianapolis always uses a 24-hour rule to process the outcomes of games and with a post-season date Saturday in New England, putting the result behind is in order. So is correcting matters that made such a comeback necessary. It was one of the most unforgettable Colts and NFL playoff games ever, and here are FIVE THINGS LEARNED. ANDREW LUCK CONTINUES TO DEFINE SPECIAL – Already a playoff starter in consecutive seasons to open a career and having tied for the second-most starting victories (22) over the first two seasons by a QB in the Super Bowl era, Luck delivered a performance that almost defied belief and description by overcoming three interceptions with four touchdown passes and guiding the Colts back from a 38-10 second-half hole to a 45-44 victory. Luck helped the Colts out-score Kansas City 35-6 over the game’s final 27 minutes. He moved the club to three TDs in 16 snaps to narrow the 28-point deficit to 10 points entering the last quarter, then capped a marathon 90-yard march by recovering a fumble and running/diving for a touchdown. At 44-38 past the midway point of the final quarter, he converted a third-and-five with an 11-yard completion, then reared back and hit T.Y. Hilton for a 64-yard strike to settle the matter. Indianapolis had five TDs in six possessions to earn the win, and Luck’s 443 yards ranked fifth in NFL playoff history. In a franchise that had John Unitas and Peyton Manning win titles, Luck’s first-ever playoff win was one for the ages. Afterward, all he could do was credit teammates for sticking with him, while Ryan Grigson compared him to Michael Jordan for always excelling in the clutch and wanting to do so in those moments. BELIEF NEVER WANES – Just this season, Indianapolis rallied from 12 points down to beat Seattle, 14 to top Tennessee and 18 to dispatch Houston. Those were the eighth, ninth and 10th comeback wins under Pagano. Saturday’s stage was bigger than the regular season, and the deficit was larger than any overcome in the Colts’ 60-plus seasons. Still, a band of brothers fought, chipped away, didn’t judge, stuck to the process, honed fundamentals and techniques – all the things Chuck Pagano said afterward were critical but made him sound like a broken record when he cited them. These players are tight. Had the comeback not happened and they had to answer why, they would have done so with complete professionalism. That is not the case and a group that never quits has 60 more minutes to fight. Belief in Pagano and the program are as solid as any team has in this league. Players play for each other as much as they play for themselves, maybe more so. SPECIAL NIGHT – Knowing how talented Kansas City is on specialty units, Indianapolis copped a better kickoff return average (30.0) than the Chiefs (26.7). Kansas City’s average was almost three yards off the NFL record it set during the season (29.4). Eight times Pat McAfee sailed kickoffs into the end zone and seven times Quintin Demps brought them out. McAfee’s kicks were five, eight, nine, six, four, six, eight and eight yards deep, and only the last one was downed by Demps, and that came after the Colts’ last score. His longest return was 34 yards, and Indianapolis met the goal of Special Teams Coach Tom McMahon of having the Chiefs play full-court offense. On kickoff drive starts, the Colts held a two-yard advantage (nine drives, avg. of 22-yard line; KC, eight drives, avg. of 20). Additionally, McAfee’s lone punt of 51 yards was returned only six yards, another victory for the Colts. Special teams were an issue in the club’s last home playoff loss in 2010 as the Jets scored a last-second field goal for a 17-16 win. This time? No dice. 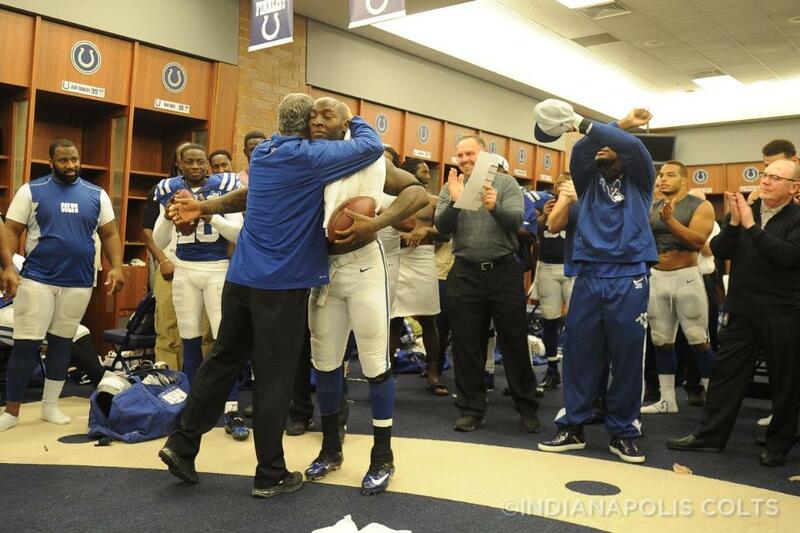 MATHIS MOMENT – All year, Robert Mathis has helped turn games with sacks and strip-sacks. His strip-sack against Denver helped ignite a nine-point splurge that put the Colts ahead in the second quarter with a lead it never yielded. He has found times to bedevil quarterbacks, and his sack-strip of Alex Smith in the third quarter set the stage for a quick 41-yard TD drive that cut a 38-10 gap to 38-24. Kansas City had run a nice offensive tempo to negate Mathis (he was an eyelash away from Smith before he threw a 79-yard TD pass for a 17-7 lead) most of the game, but the NFL sack champion got one that counted. This team feeds off many sources, but this “pillar” player had a timely play in a comeback. Since Luck said there were no 28-point plays to be made, this one play was huge. WINNING KEY STATISTICS – An abnormal day saw the Colts win a game with a minus-three turnover ratio while allowing more than 500 net yards and owning the ball not even 23 minutes. Kansas City converted nearly 60 percent of it third downs (nine-of-16) and inflicted major damage on that down with two early TDs. All year long, Pagano said next to points that turnovers tell the tale of outcomes. The Colts were out-scored, 17-14, in points resulting from turnovers, so that tale was suspended for a day, a key day. According to ESPN number crunchers, the Colts had only a 3.6 percent chance to win when they trailed by 21 points at the half. After Luck’s interception to open the third quarter, that percent dipped to 0.9 when the Chiefs upped the deficit to 38-10. Whatever numbers may be, Indianapolis caught lightning in a bottle with the NFL’s second-largest post-season rally. Winning twice while having such deficits in key categories likely is not possible next weekend. Intro: Indianapolis controlled almost every aspect of a game for the third straight week in moving from 8-5 to 11-5 with a 30-10 victory over Jacksonville. The Colts earned the momentum they sought entering December, and now it is on to January. INDIANAPOLIS – After Sunday’s 30-10 victory over Jacksonville, Chuck Pagano said everyone knows the second-most important month to be playing good football is in December. He then pointed to his team’s 4-1 mark that was forged with three straight double-digit wins to end the season. It was a strong response following a December 8 lopsided loss at Cincinnati, 42-28, the day Indianapolis captured the AFC South crown. Knowing better play was imperative, the Colts focused on basics and end up entering the playoffs with much-needed steam. After the club’s impressive victory over the Jaguars to go 6-0 in the division, here are FIVE THINGS LEARNED. WINNING ELEMENTS – A message that Chuck Pagano uses that irks a few followers is, “In the NFL, more games are lost than won.” It’s not that Pagano doesn’t take calculated approaches to win, he just wants to avoid pitfalls that equate to losses – two being penalties and turnovers. Indianapolis became the second team in 26 years (Kansas City, 2002) to top the league in fewest penalties (66, for 576 yards) and turnovers (14). The Colts rebounded from minus-12 to plus-13 in turnover ratio from 2012 to 2013 (a jump from 26th to third). The turnovers set a franchise record. The team had three or fewer penalties in eight outings and only hit 40-plus infraction yards six times. The NFL penalty-yard average was 98-845. Of 12 playoff teams, 10 have positive or neutral turnover ratios. The top six ratios all are playoff teams. POSSESSION ADVANTAGE – While points win games, so can possession time. Indianapolis won its last three games by controlling the ball 33:11, 38:20 and 33:40. In eight of those 12 quarters, the Colts held the ball for nine-plus minutes and only three times lost the possession margin. It speaks to executing third downs as well as ball security. The Colts are 7-1 this year when topping 30-minutes. Clearly the team is doing something with the ball when it has it, but keeping it usually means an opponent is being held at bay. SPECIAL LUCK – Andrew Luck now is tied for the second-most wins by any QB since 1970 for the first two seasons of a career (22). His 8,196 passing yards are the most ever over the first two seasons. Luck is on a short list of Super Bowl era QBs who opened or are opening their careers with consecutive seasons with playoff starts (5, Joe Flacco; 3, Dan Marino, Bernie Kosar, Andy Dalton; 2, Shaun King, Ben Roethlisberger, Mark Sanzhez, Luck, Russell Wilson). Dalton, Luck and Wilson are current streaks. Enjoy Luck as he starts in his second playoffs. It’s been a wondrous run so far by a special talent. Note: Luck has hit five, nine and 10 different receivers in the last three games, some of whom did not start the season here. UP TEMPO, AGGRESSIVE LEAD FROM START – The last three games have seen the Colts pick up the tempo a notch on offense. Sunday saw the club probe down the field in an aggressive manner. There are factors that help a team get off quickly in a game, and this has helped as the Colts own a 24-10 first-quarter and 53-13 first-half points advantage in that time. The previous six games had seen the club labor with 49-9 and 112-24 deficits over those opening quarters and halves, while holding the lead but once. Keeping the foot down can help the passing game and open up some running room. On Sunday morning, NFL Network aired a segment with Warren Sapp and Robert Mathis. Sapp came to the Indiana Farm Bureau Football Center to learn about the “art of separating the ball from the quarterback” from the NFL’s all-time leader in Mathis. Here’s video of the segment between the Hall of Famer in Sapp and a potential Canton inductee in Mathis. An interesting tidbit that Mathis pointed out in the segment is that he’s a natural leftie which allows him to line up in different spots. Although he admits he has a faster step coming off the defensive right side.